It began with a 1900 ship manifest showing my relative, Giuseppe Caruso, on line one. I found this record very early in my family history research. My second great uncle and another man had the same brother-in-law. Hmmm. Giuseppe was my great grandmother's brother. I was looking for evidence that would lead to her ship manifest. This was a solid lead. It confirmed two facts: Giuseppe came from the town of Pescolamazza, Italy, and he was going to Elmira, New York. Those facts we enough to make me feel I had the right Giuseppe Caruso. Before I filed the document away, I noticed the passenger on line two. Nicola Capozza was also from Pescolamazza. He was also going to Elmira, New York. But here's the curious part. Both Giuseppe and Nicola said they were joining their brother-in-law Michele Castelluzzo. That's intriguing. I didn't know who Nicola Capozza was, but he and my great grandmother's brother shared a brother-in-law. Skip ahead several years. I ordered the marriage certificate for my great grandparents from the state of Ohio. At that point I didn't know the maiden name of Maria Rosa's mother. This marriage certificate could be just what I needed! What could I learn from the witnesses to my great grandparents' marriage? 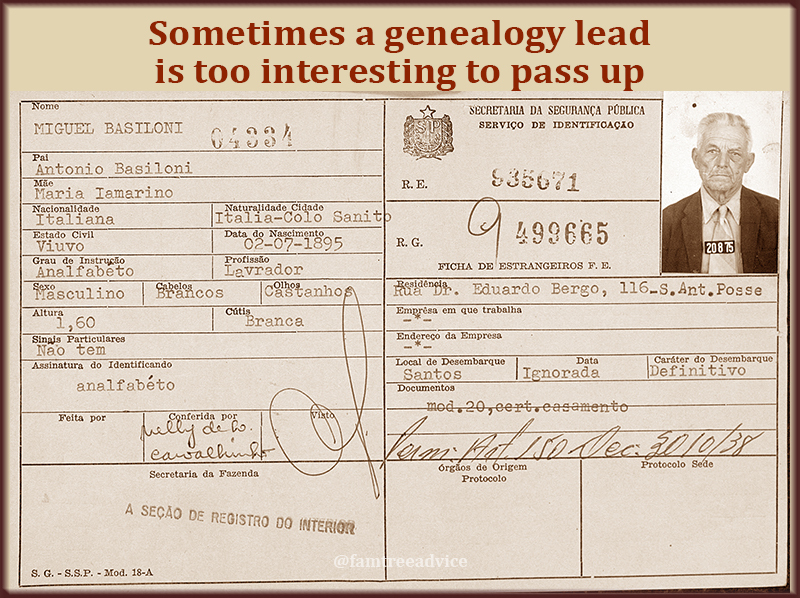 If you've been dabbling in genealogy a while, you know how often the clue you need the most is the one that's missing. That's the case with this marriage certificate. My great grandfather's parents' names are there. But I knew their names already. For the parents of the bride, it says "Francesco de Benevento" for her father. Well, her name is Caruso, and they were from the province of Benevento, so someone mistakenly wrote "Francesco from Benevento". No harm done. It's her mother's name that's the problem. All it says is Maria Luigia. No last name! Still fuming, I turned my attention to the back of the marriage certificate. The witnesses to my great grandparents' wedding were Nicola Cappocci and Nicoletta Cappocci. I figured they were a married couple who knew my family. I wanted to know more about them. There was a chance Cappocci was a misspelling since these were not signatures. 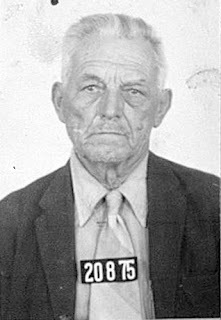 Several wild-card searches later, I determined Nicola Cappocci was Nicola Capozza who shared a brother-in-law with my second great uncle, Giuseppe Caruso. I found Nicola and his wife Nicoletta in the 1905 New York census. They were living with Giuseppe Caruso and his family. Then I found a 1909 ship manifest with Nicola coming to Susquehanna, Pennsylvania. Giuseppe Caruso lived there at the time. But Nicola's wife Nicoletta was back in Pescolamazza. Next I found Pescolamazza birth records for Nicola Capozza and Nicoletta Martino on the Antenati website. But I hadn't tied Nicola and Giuseppe to that shared that brother-in-law. The connection—not surprisingly—came from all the intermarrying of families in small Italian towns in the those times. That the Capozza siblings' mother was also a Caruso is making my head spin. 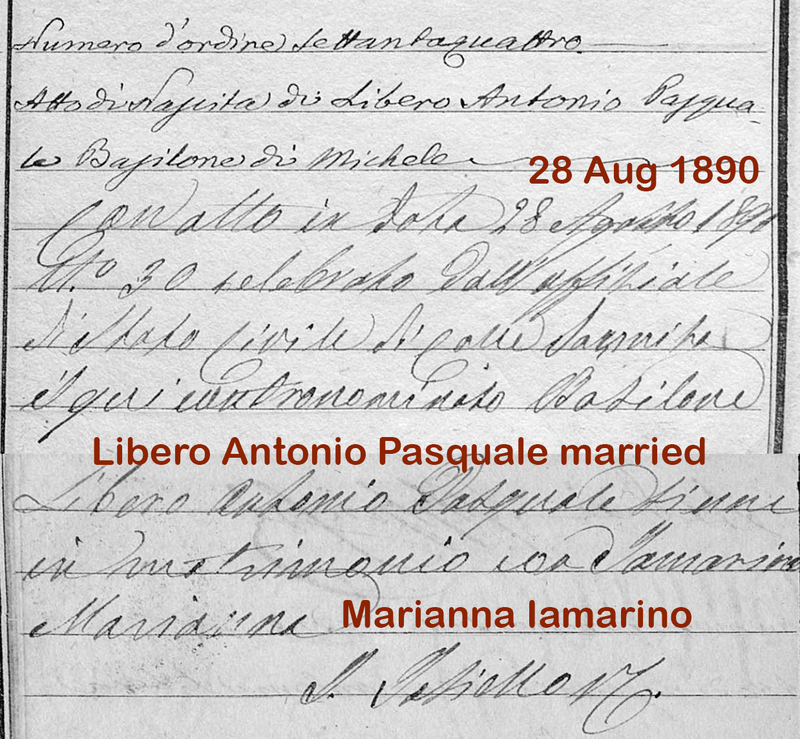 Nicola Capozza's sister Marianna married my Giuseppe Caruso. So Nicola and Giuseppe, travelling together in 1900, were brothers-in-law. There were eight Capozza siblings. One of the girls, Caterina Capozza, married—wait for it—Michele Castelluzzo. Michele came to America around 1891 and lived in Elmira, New York. There was plenty of railroad work, so Michele sent for his brothers-in-law. His wife's brother Nicola came to work. His wife's sister Marianna's husband Giuseppe Caruso came to work. Giuseppe Caruso brought over most of his siblings. It's a safe bet that Giuseppe met my great grandfather, Pasquale Iamarino, working there in the Elmira railyard. 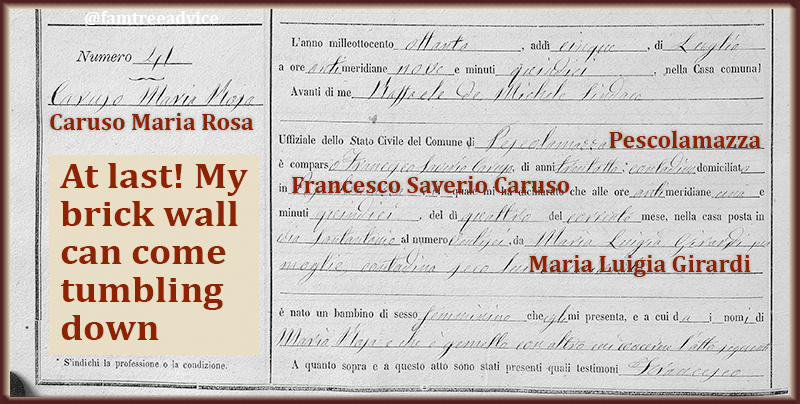 He liked Pasquale enough to suggest that he marry Maria Rosa Caruso, who was still in Italy. 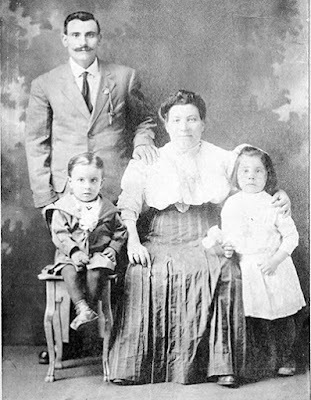 In July 1906 Maria Rosa came to join her brother in Elmira. 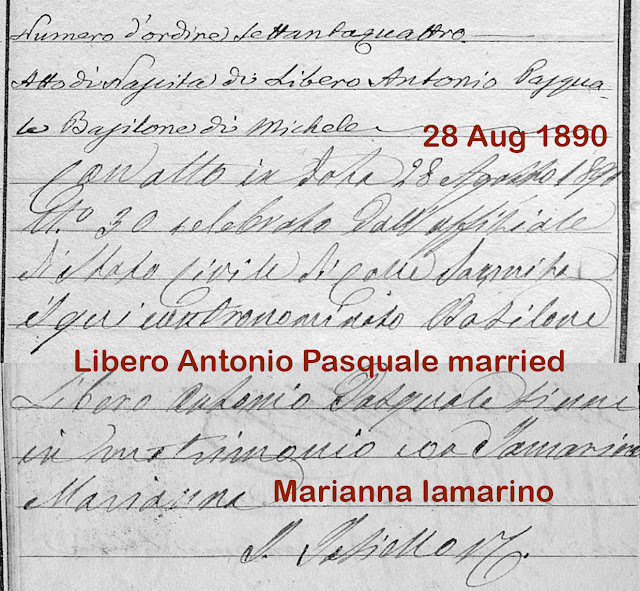 Four months later, she married Pasquale Iamarino. Every piece of evidence adds to the rich tapestry of our ancestors' lives. When I first saw that name of the shared brother-in-law, I didn't know he was significant. But if Michele Castelluzzo hadn't gone to work for the railroad in Elmira, New York, my great grandparents would never have married. In fact, if Giuseppe Caruso hadn't married a Capozza, the Caruso family and the Iamarino family may never have met. You have to marvel at how much luck and happenstance it take for you to be born. I couldn't build my great grandmother's family tree. What was your biggest disappointment when you began your family tree research? The 1890 U.S. Census went up in flames. Yeah, that's a tough one. What else? 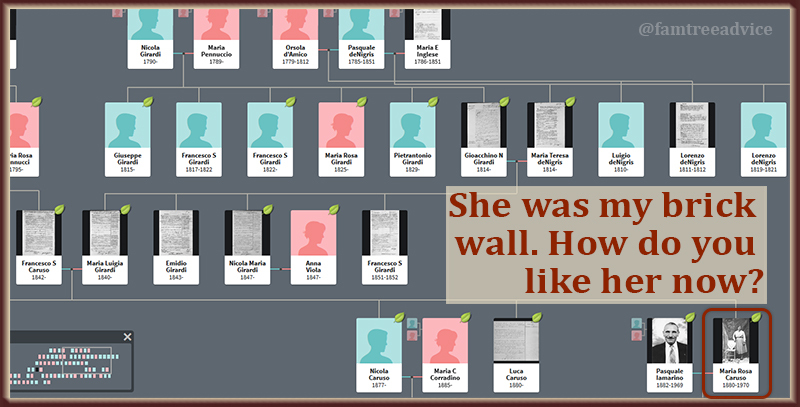 Tracing female ancestors is so hard without a maiden name. For sure. But unlike the 1890 census, you can find maiden names. Here are some of the genealogy resources that can provide your ancestor's maiden name. You may not be able to get your hands on some of these. Others may not exist for your ancestor. Any one of these resources may hold the key to unlocking another generation in your family tree. 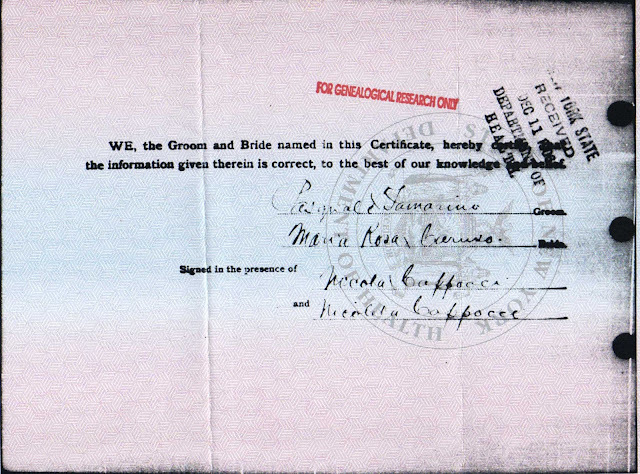 Birth, Marriage, Death Certificates—These documents should contain your ancestor's maiden name. If you can't find them, branch out. Her maiden name may be on her children's birth, marriage, and death records. If you find different versions of her maiden name, weigh your evidence. Is the oldest-recorded document the most accurate? Do you trust the spelling you've found in 3 places more than the unique spellings? Census Forms—Decades ago, multiple generations lived in one household. If you can find your ancestor with her husband and children, see who else is living with or near them. 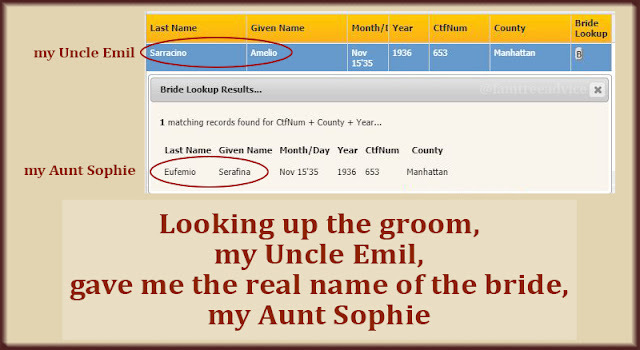 If there is a mother-in-law or brother-in-law in the home, you may have found your ancestor's maiden name. If there is a family next door whose first names match the known siblings of your ancestor, they may be her family. Passport Application—Your male ancestor's passport application can tell you a lot about his wife and children. This is especially true if the family was travelling together. You might discover each person's full name, date and place of birth, and the wife's maiden name. Plus, their family photo is priceless! To learn more about this resource, please see Your Family Tree Needs Your Ancestor's Passport Application. Naturalization Papers—Many of our ancestors who came to America had no intention of ever leaving. They officially declared their intention to become a citizen. They filed a petition for naturalization. If all went well, they became U.S. citizens. Each step of the naturalization process generated paperwork. If you find that paperwork, you can learn dates and places of birth, the applicant's father's name, and a woman's maiden name. U.S. Social Security Applications and Claims Index—Several months ago I wrote about discovering my great great grandmother's maiden name with this database. She didn't have a Social Security Number. It was her son's record that gave me the clue I needed. To learn exactly how I did it, please see This Expanded Resource Provided an Elusive Maiden Name. Now I've been able to get her birth record and more. Finally! Her maiden name was Girardi. Genealogy is a treasure hunt. The more clues you can find for your ancestor, the stronger your family tree will be. How Do I Get There From Here? or Why You Really Need to Cite Your Sources!